Join us for an exciting dinner event that will encompass our three Puyallup Brookdale Communities. The event will begin at Brookdale Puyallup for delicious appetizers and sparkling cider. From there you go to Brookdale Courtyard to have a light, flavorful meal. 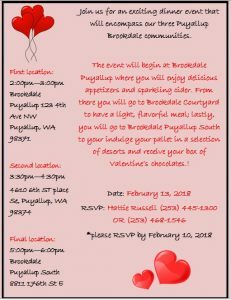 The last location will be at Brookdale Puyallup South for dessert and Valentine’s Day chocolates! Please RSVP February 10th to Hattie Russell: 253-445-1300 / 253-468-1546.